CoCoRaHS, the Community Collaborative Rain, Hail, and Snow network, is a non-profit group of volunteers of all backgrounds and ages who measure precipitation right in their own backyards. The network was founded in 1998 in Colorado and has expanded to all 50 states, Puerto Rico, the U.S. Virgin Islands, the Bahamas, and Canada. Every March, the network holds a contest to see which of the 50 states can recruit the most new volunteers. The winning states (there are two categories) host the CoCoRaHS cup for the year. 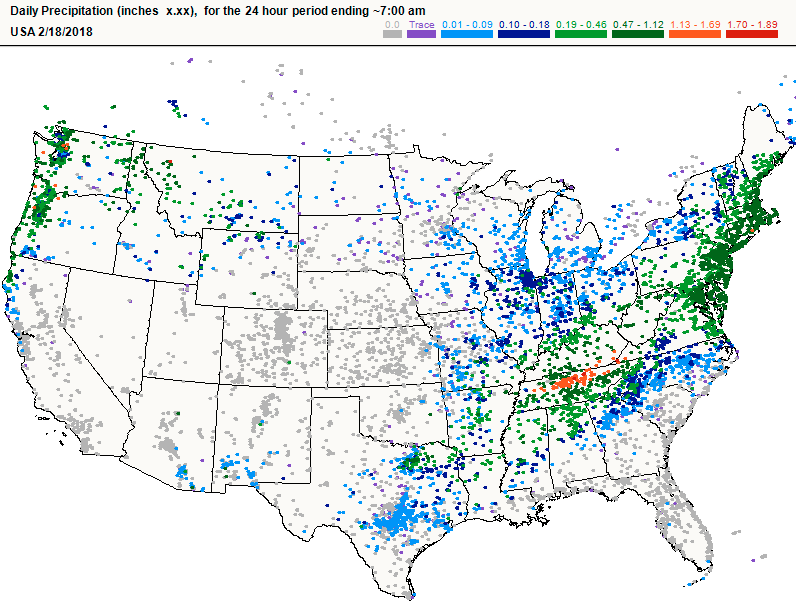 All the dots represent CoCoRaHS reports (image credit - CoCoRaHS). The network is important for many reasons. First, precipitation is highly variable. You’ve probably seen a situation where it was raining in one spot, but perfectly sunny just a few miles away. Second, precipitation data is important, but sources are few in number and far apart. The picture below shows stations in one of the NRCC’s climate databases. The left picture is of official climate sites. Notice all the gaps in coverage? When you add in CoCoRaHS sites, those gaps get smaller (right picture). 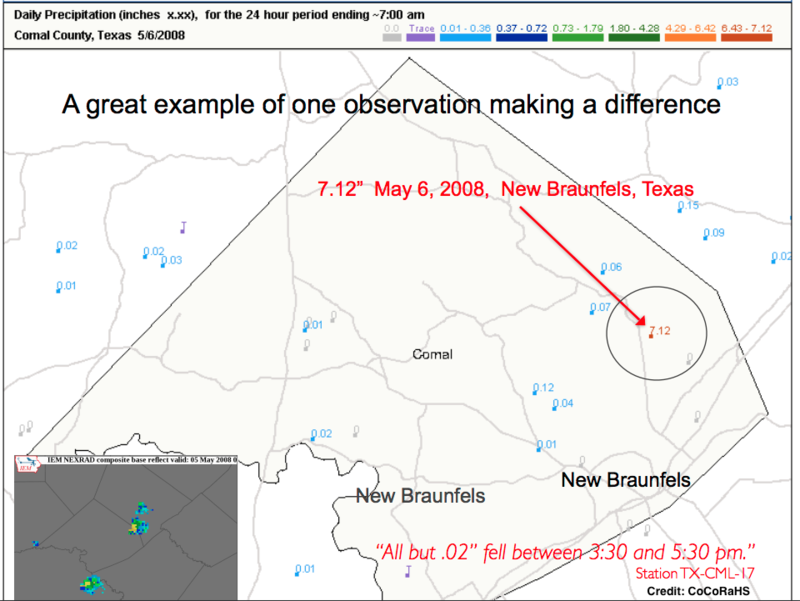 Third, precipitation measurements aren’t always accurate or don’t appear to be accurate. With more stations, data can be verified more easily. 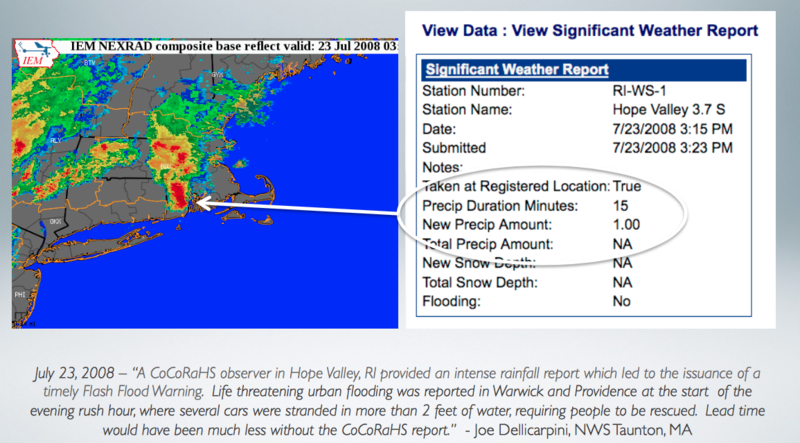 Lastly, storm reports can save lives! 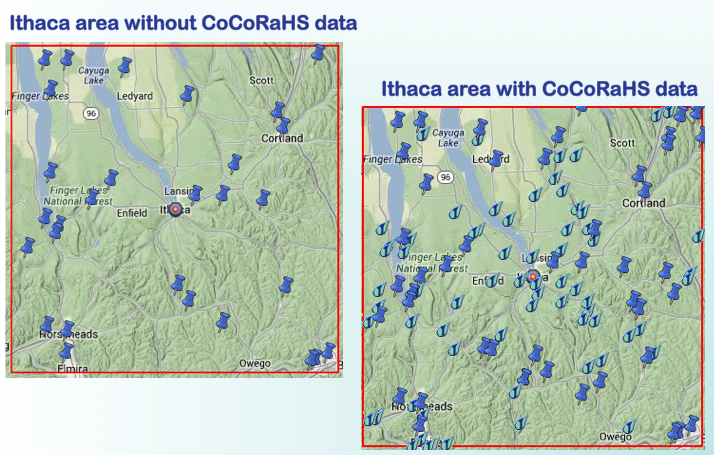 Official sites only (left), and official sites with CoCoRaHS sites (right). There are only a few requirements to be a volunteer. Enthusiasm for and an interest in weather observation is a good start. You’ll need to purchase a CoCoRaHS-approved rain gauge and find a good place to set it up. All observers use the same gauge for consistency, basically so we’re comparing apples to apples. You’ll also need to take the online training (which includes instructions on how to find a good spot for your gauge). You’ll need internet access because that’s how precipitation measurements are reported. And lastly, you need to sign up! It’s preferred if precipitation is measured daily at 7 AM, but volunteers can report as much or little as they want. The data is used by many groups, including the National Weather Service and National Hurricane Center, hydrologists and water resource managers, transportation departments, insurance companies, USDA, farmers, emergency managers, engineers, recreation groups, schools, researchers, the media, and so on. If you’re interested in joining, go to http://www.cocorahs.org. 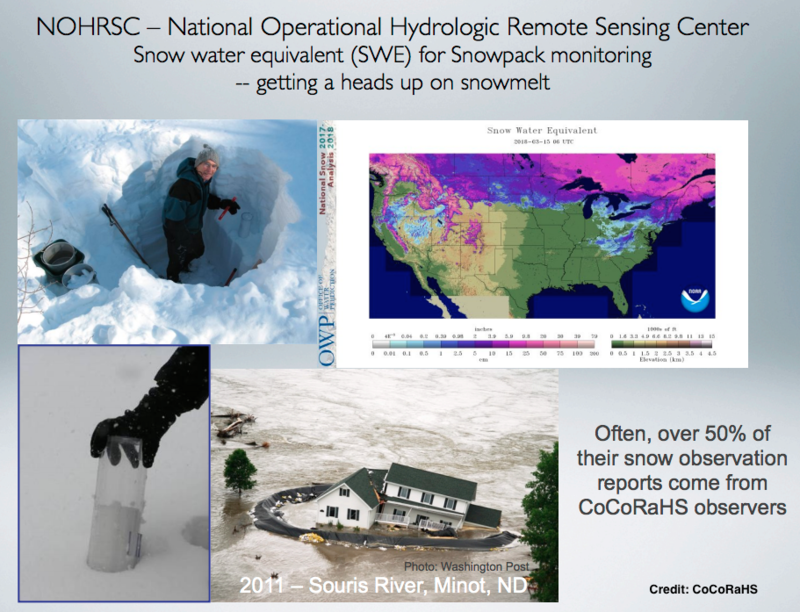 An example of how a CoCoRaHS report helped the National Weather Service and the community (image credit - CoCoRaHS).